Thornbury has 2 Spaniels belonging to the owner who visit on a daily basis. We have always had a policy of allowing pets belonging to residents in the home where it is felt that they would fit in. Each resident has their own room. Each resident can furnish their room as fully as they like with their own possessions, including furniture. All rooms have a television point. Each resident can have a telephone installed so as to maintain contact with their family and friends. Thornbury is also within 75 yards of the main high street and therefore is near to the library, banks, shops, clubs, cinema, restaurants, and a day club. Residents of Thornbury can enjoy the benefit of a conservatory overlooking the garden, waving to passers by! The communal lounge has a video and television for those who enjoy this facility particularly in the winter when the log fire gives a very cosy atmosphere. 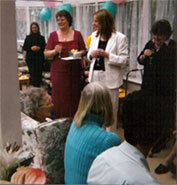 Our central dining room, where lunch and supper are mainly served, encourages social interaction between residents. Thornbury has an easy to use chair lift operating between the ground and first floor. All bathrooms have the facility of mechanical bath lifts enabling all residents to enjoy a leisurely soak in the bath. The library supplies 60 large print books every second month for the enjoyment of the residents of Thornbury. An activities organiser is employed for several mornings a week, encouraging residents in a variety of activities including cards, dominoes, drawing, colouring, flower arranging, quizzes, gentle exercise, board games etc. Monthly concerts are also arranged encouraging residents to sing, dance, and otherwise join in - these include karaoke sessions to old time music. Outings occasionally are also arranged depending on the general mobility of the current residents. Visitors are encouraged at any time.